PROFINET input and output. Switch built-in. 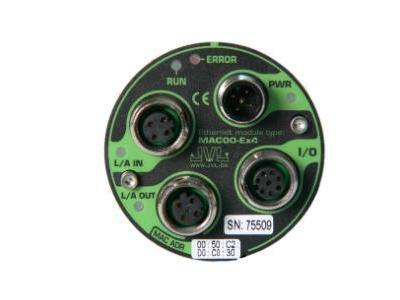 For built-in PLC with ( MAC400-3000 ) or HWI for MAC050-141 etc. 1 digital input for enable, limit etc. 1 analogue input for zero search and adjustment etc. 1 digital opto-isolated output up to 15mA for In Position, Error etc. 4 digital inputs for enable, limit etc. 2 digital opto-isolated outputs up to 15mA for In Position, Error etc. 2 analogue inputs for zero search or adjustment etc. PROFINET is the innovative open standard for Industrial Ethernet, development by Siemens and the Profibus User Organization (PNO). With PROFINET, solutions can be implemented for factory and process automation, for safety applications, and for the entire range of drive technology right up to clock-synchronized motion control. PROFINET is standardized in IEC 61158 and IEC 61784. Profinet products are certified by the PNO user organization, guaranteeing worldwide compatibility. PROFINET is based on Ethernet and uses TCP/IP and IT standards and complements them with specific protocols and mechanisms to archive a good Real Time performance. PROFINET enables the integration of existing Fieldbus systems like PROFIBUS, DeviceNet, and Interbus, without changes to existing devices. That means that the investments of plant operators, machine and system builders, and device manufacturers are protected.